Ferriter Arms: A short overview of Irish Heraldry, and investigations into Armorial symbols as may have been held by members of the Ferriter family. 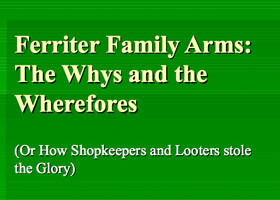 This presentation briefly discusses what the origins of some Irish Arms are, and touches on the possibilities of the Ferriter family situation regarding such symbols. 2. 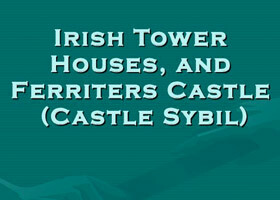 Irish Castles: This talk focused upon the ubitquitous Irish Tower House - by far and away the most common type of castle in Ireland. The origins of these structures, and the identification of Caslain Fheiritearaigh - "Ferriter's Castle" as such an edifice is presented. 3. 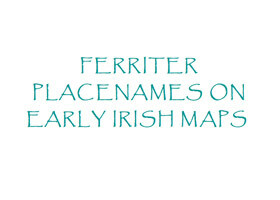 Ferriter Placenames on Irish Maps: Here is a very topical overview of the seemingly unique proliferation of the family name Ferriter as given to geographical locations at the tip of the Dingle Peninsula: Ferriter's Haven (Ferriter's Cove), Ballyferriter, Ferriter's Castle, Ferriter's Islands (The Blaskets), and Ferriter's Quarter are all identified, and the survival of these placenames pointed out.